Myrtle Beach and its surrounding areas along the Grand Strand have been known for the last few decades as both family-friendly vacation destinations, as well as beach escapes for golf enthusiasts. 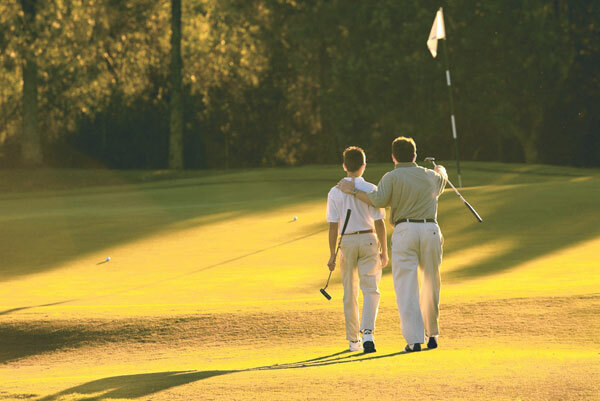 With dozens of courses, you will never run out of golfing options during your Myrtle Beach vacation rental experience. Aside from playing host to daily tee-times and practice rounds, however, the area often hosts many golf tournaments and events. This July 19-22, get ready for the National Father & Son Team Classic, which pits teams of dads and their kids against other teams, as they take on some of the most beloved courses in the area. This three-day tournament will see over 900 players battle it out in this 54-hole competition that also includes skills challenges and driving, putting, chipping and closest to the pin contests. The event will feature the following host courses: Fazio at Barefoot Resort, Parkland at Legends, Tigers Eye Golf Links, Rivers Edge, Grande Dunes Resort Club, Wild Wing and Prestwick. For a perfect father/son outing, take part in the National Father & Son Team Classic, where you can put your talents and luck to the test alongside your best buddy! Enjoy the lush green hills of our Grand Strand golf courses, and take some time to visit other area attractions like Broadway at the Beach, an assortment of miniature golf locations, and of course, the relaxing beachfront. Take advantage of warm weather, sunny skies, great golf, and family competition when you stay and play in the Father & Son Team Classic this July!